Partially in response to this diagnosis some new approaches to national policy for climate change adaptation are now being developed and applied. These include the national adaptation programmes of action (NAPAs) agreed in October 2001 in Marrakesh at the 7th meeting of the Conference of the Parties to the Framework Convention on Climate Change (COP 7). The preparation of these plans of action, and other studies being supported with funds from the global environment facility (GEF) draw upon the concepts developed in the adaptation policy framework (Burton and Lim, 2000). - Assess policy and measures for adaptation in a development context. This is at the same time the most important and the most difficult part of the APF exercise. The importance is related to the need to integrate adaptation into national development strategies and to take account of socio-economic scenarios, national and global. 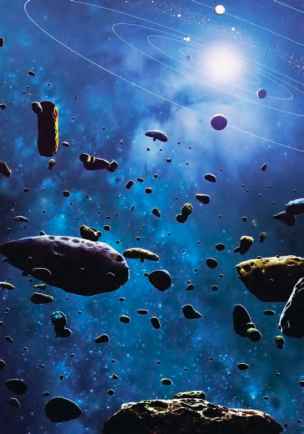 There are inevitable difficulties related to the very concept of policy. Policy-making is by its nature a complex process in which a wide range of interests and ideas compete for attention. How climate change is weighted in the policy process necessarily depends upon national and local circumstances. - Start with recent climate experience; current impacts from climate variability and extreme events; and current or baseline adaptation in order to provide an empirical foundation for the choice of future adaptation. - Explicitly include adaptation to current climate variability and extremes as a step towards reducing vulnerability to longer-term climate change. - Adopt a stronger focus on vulnerability than has been the practice in previous work. This attention to vulnerability in the present helps to guide policy and measures towards priority development needs such as those identified in the UN. Millenium development goals, and poverty reduction strategy papers. - Give specific consideration to current development policies and proposed future activities and investments, paying particular attention to those activities that may tend to increase vulnerability to climate change or which are maladaptive. - As part of the development of national policy, include a "bottom-up" or vulnerability-driven risk assessment approach to adaptation in which the actual adaptation measures in place, and vulnerability is assessed at the local and community level. Ensure to the extent possible that national policies and international agreements are designed to facilitate adaptation and enhance adaptive capacity. - Engage stakeholders in the process at all stages. Figure 1. 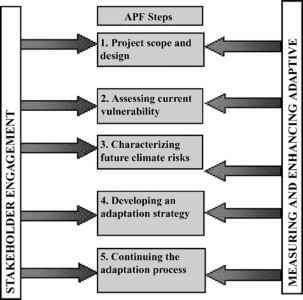 The APF steps (Spanger-Siegfried and Dougherty, 2004). involves an understanding of the policy process itself, and choices about the sector(s) to be studied. Step 1 also includes the initial formulation of ideas for an adaptation strategy so that this may be tested and elaborated throughout the study. The purpose of Step 2 is to make a thorough assessment of the present situation. It essentially asks the question, "Where do we now stand with respect to our vulnerability to climate risks; what are the factors generating vulnerability, and how successful is current adaptation?" This analysis gives rise to ideas and suggestions for ways in which current vulnerability can be reduced and adaptation made more effective. While the improvement of adaptation policies and measures to current climate variability and extremes can be a step in the right direction, it is not likely to be sufficient to deal with all the risks of climate change. Potential future conditions have to be taken into account. This includes likely future vulnerability, which itself depends upon climate change and socio-economic conditions locally, nationally and globally, as well as trends in related areas of natural resource and environmental management. The major task of Step 4 is to synthesize the results of Steps 1-3 of the project together with any prior information, and to create a coherent set of adaptation policy suggestions and associated measures. Step 4 also involves working with stakeholders and policy makers to ensure that a set of proposals are brought forward for further assessment. The completion of Step 4 may mark the conclusion of a particular policy study. But this is only the beginning of the adaptation process. Provision must be made for the ongoing monitoring and evaluation of adaptation. New institutional arrangements may be required and further opportunities for specific capacity building identified. If the project has been limited in coverage of sectors, regions, or risks, further work may be required. The APF is being developed by UNDP at a generic level. More specific guidelines are needed sector by sector. The World Health Organization (Rome office) is developing a set of guidelines for the assessment of adaptation to climate change in the health sector. Perhaps a similar activity led by WMO with partners such as FAO and CGIAR would be useful and timely.